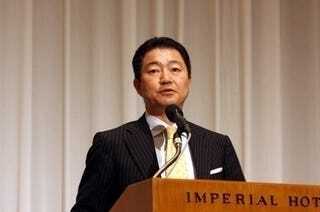 Imperial Hot is our nickname for Square Enix president Yoichi Wada. Big important guy like him, managing an international corporation, he probably has no idea about the internet meme we started, right? See Yoichi Wada has begun twittering (feel free to follow him, he's @yoichiw) and answering questions in Japanese from regular folks. Questions like, "Have you heard of 'Imperial Hot'?" "I have heard of 'Imperial Hot,'" Wada tweeted. "But it sounds like a bad guy..."
Seems like someone is thinking too much about the "imperial" part and not enough about the "hot" part! The podium that Wada is standing behind actually says "Imperial Hotel", which is a real hotel in Tokyo. (You can stay there if you like!) We just clipped the image so that it ends on "Hot". And it amuses us. Some else on Twitter also asked Wada if he had seen this image. In it, Wada says "All FF goes to Microsoft..." Below, Square Enix designer Testuya Nomura says, "I will protect Versus", referring to his upcoming PS3 title Final Fantasy Versus XIII. Wada replied, "That picture, it's Microsoft at E3. The stupid looking one with the arms wide open. Those were the directions from Microsoft's stage staff!!" Imperial Hot seems like a cool enough dude.